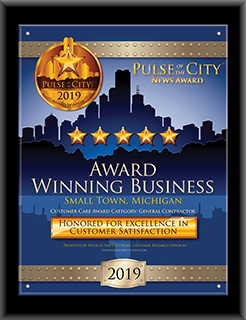 There is no better attention-grabbing way to display your Pulse Award than in the form of the Pulse of the City Customer Satisfaction Award Plaque. The plaque is a 10” by 13” blackwood-plaque-mounted-and-framed, full-color Pulse of the City Award Winner certificate. The plaque’s inscription includes your company’s name, location, award category, star rating and year. Protecting the certificate inside the plaque mounted framing preserves its impressive eye-catching information for years to come. Displays of a history of awards of excellence are even more impressive. Use the plaque to display your award proudly on your wall to show that your business excels and that it places high priority on its customer service. With the Plaque of Honor you also receive a digital image of the plaque for your website, Facebook page, and other marketing materials. Using both in combination reminds existing customers of your award status and portrays it online for them and future customer prospects checking you out as well.